“I love playing football. When I play football, I don’t feel like I’ve lost anything at all." 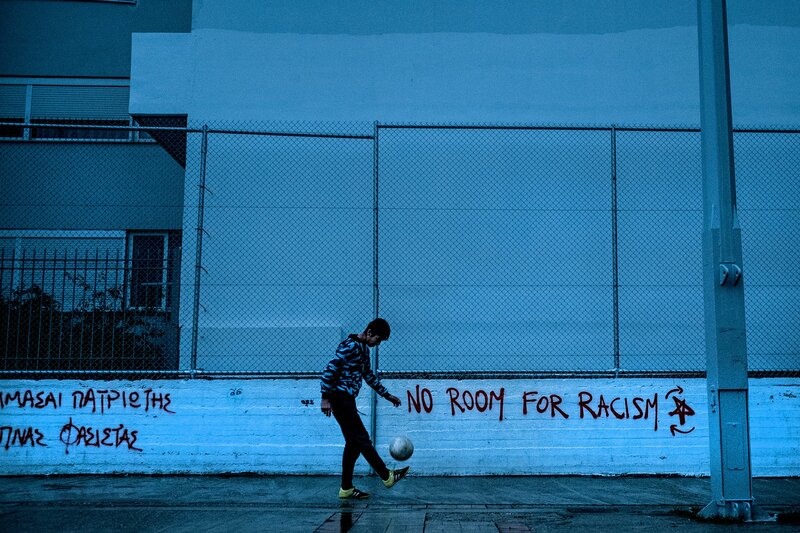 Those are the words of Saja, a 13-year old Syrian girl, who was photographed by UNICEF for a series on soccer in places of crisis. 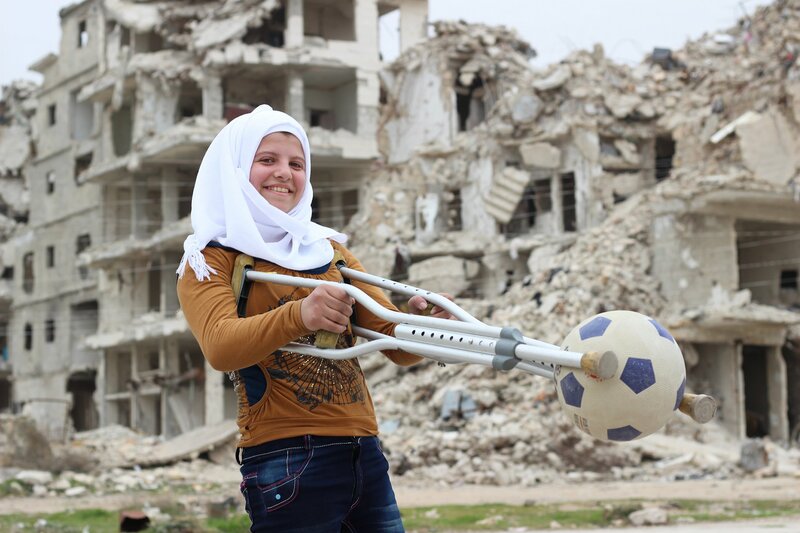 In the photo, she's holding a soccer ball between two crutches. Mounds of rubble sit in the background of the image, which was taken in March 2017, six years after the country's civil war began. Saja is one of many children who find solace in sport and the freedom it offers. Playing is an essential part of any childhood, and sports in particular help children build confidence, learn how to cooperate, improve their mental health, get exercise, and much more, according to UNICEF. Read More: These Gorgeous Photos Show the Complexity of the African Continent. Yet children around the world are deprived of their fundamental right to play because of conflcts, disasters, extreme poverty, and more. 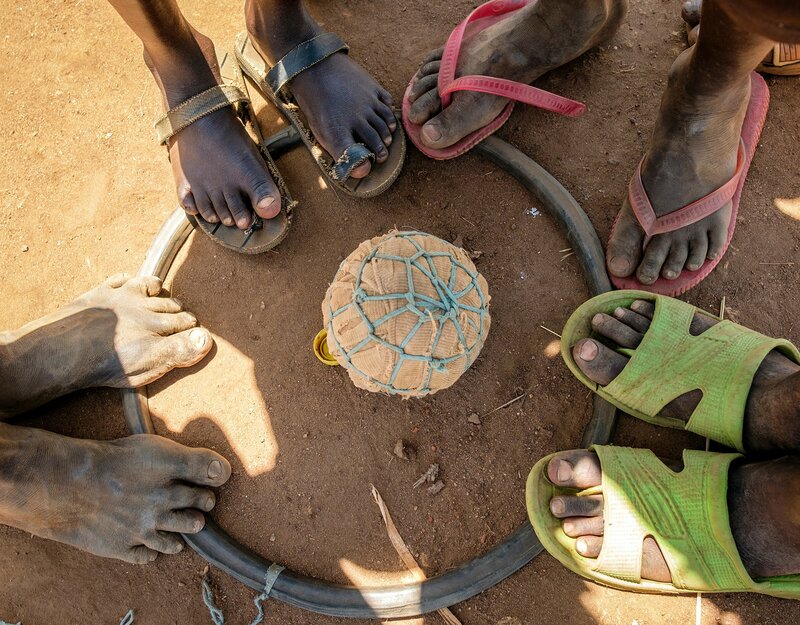 In this photo series, UNICEF shows children in difficult situations who have been given the chance to play soccer. Their expressions are unguarded, happy, and focused. And, as Saja understands, their biggest problems fade away. 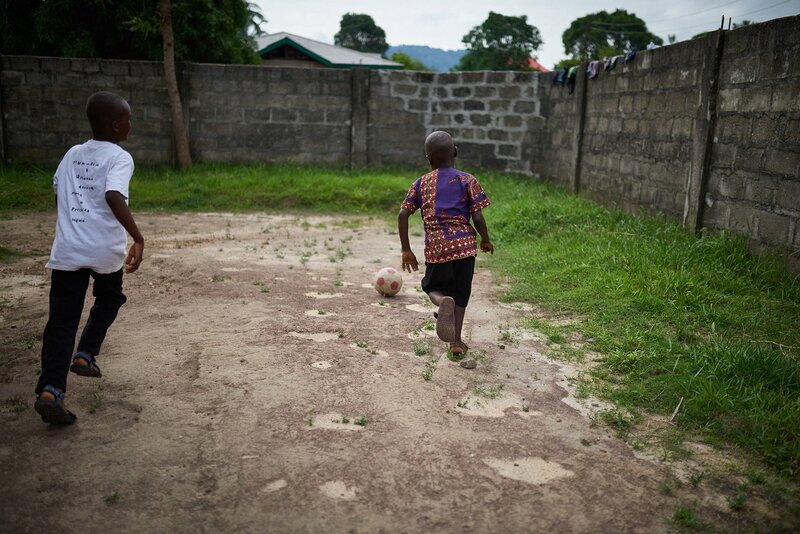 While playing soccer, the kids are able to forget about their hardships for a few moments and have fun. It's a reminder that as countries compete in the World Cup in Russia over the next several weeks, soccer means more than goals and victories. For millions of people around the world, the sport is a form of hope. 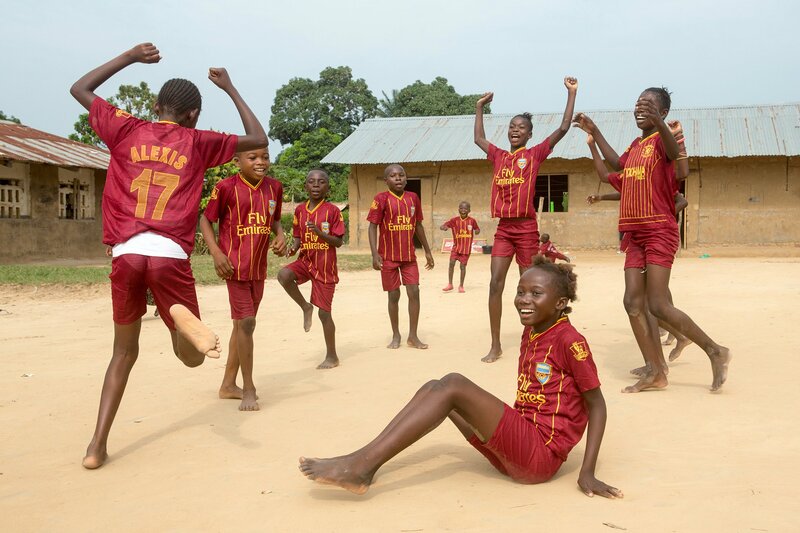 Boys and girls from Mambote Primary School in Bandundu City, Capital of Kwilu Province, Democratic Republic of Congo, celebrate their victory after a football match organized by a UNICEF and their partners in October 2016. 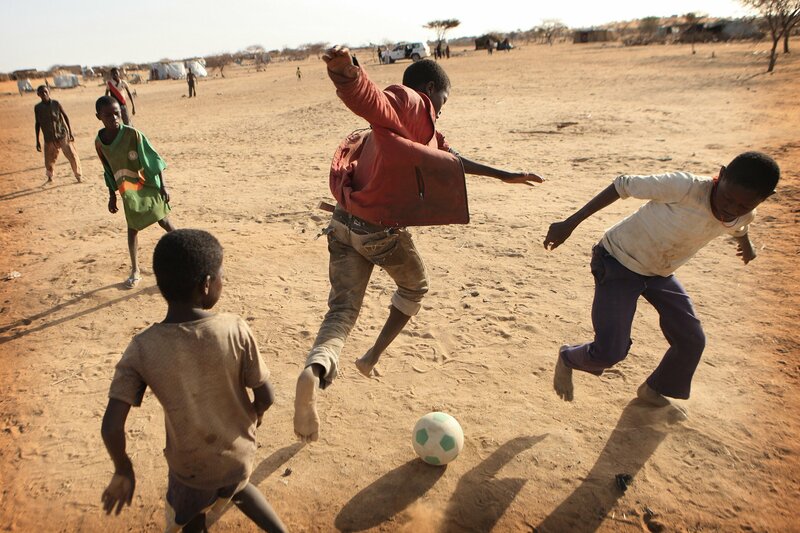 A soccer game takes place between young refugees from Mali, in Niger, April 2014. 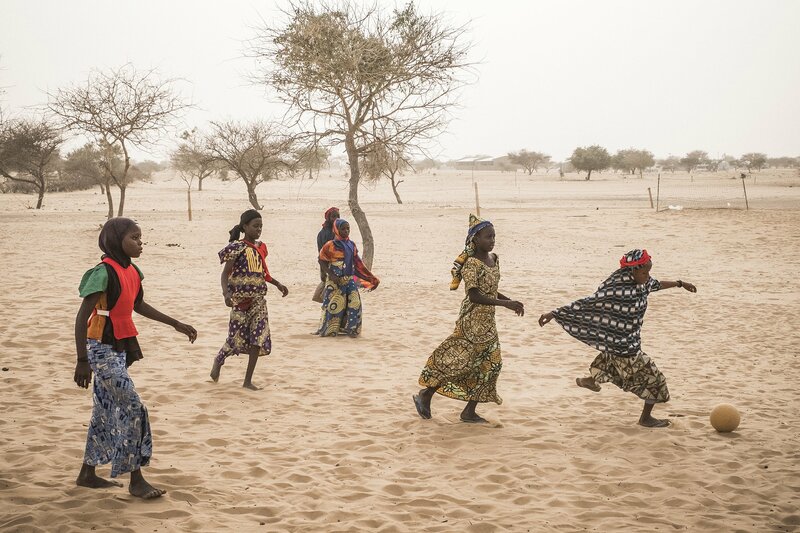 Following military intervention and the political crisis in Northern Mali, refugees fled to Algeria, Burkina Faso, Guinea, Mauritania, Niger and Togo. 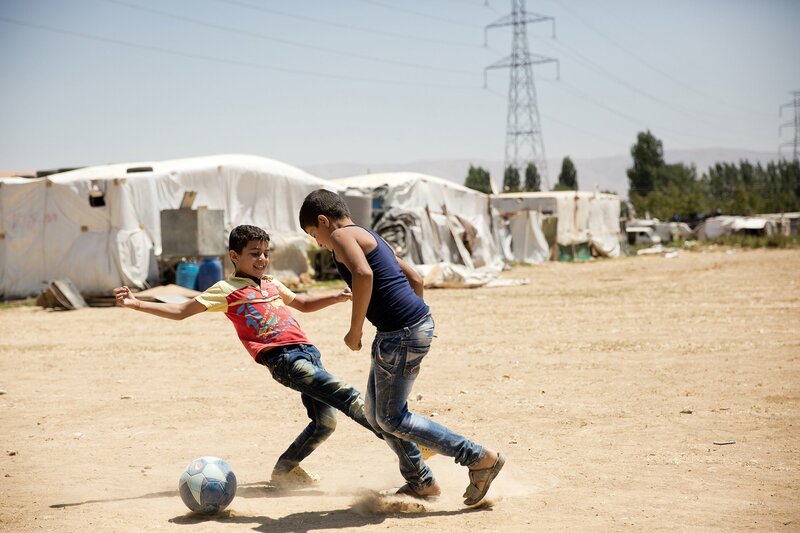 Syrian refugee children play soccer at an informal settlement in the Bekaa Valley, Lebanon, in August 2016. As of June 2017, Lebanon hosts an estimated 1.5 million Syrian refugees. 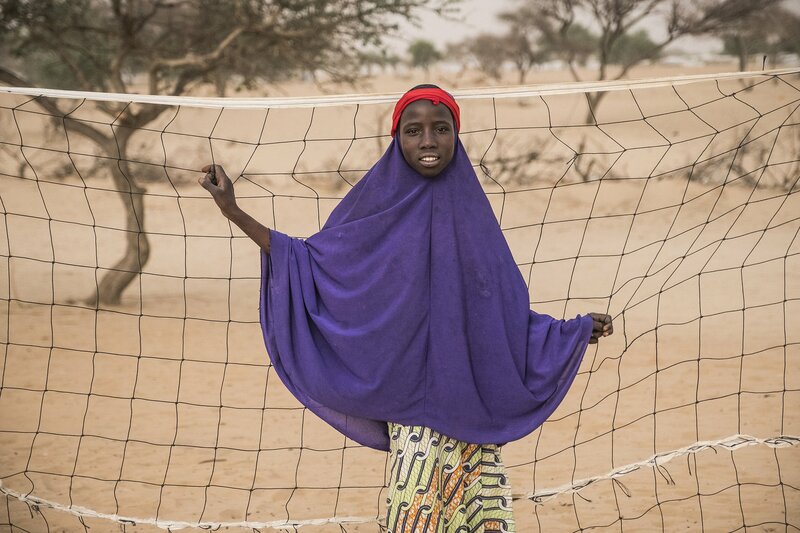 Nigerian refugee Patimi Muhammed, 20, displaced by Boko Haram militants, tends the goal as she plays soccer with other residents in Daresalam refugee camp, Lake Region, Chad, in April 2017. Children play football in muddy water during high tide in Tebunginako village, Abaiang Atoll, South Tarawa, Kiribati in 2016. Abaiang is most threatened by rising sea levels. 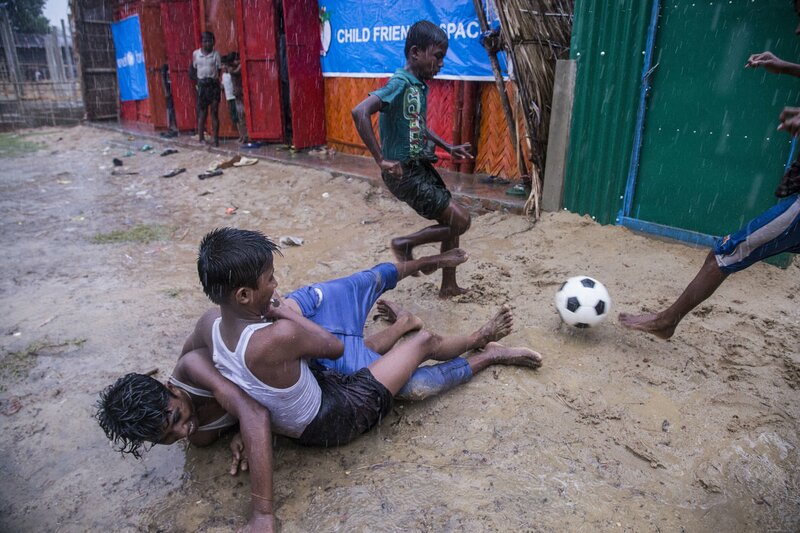 Boys play soccer in the rain in Balukhali refugee camp, Cox's Bazaar, Bangladesh. Well over half a million Rohingya people have crossed into Bangladesh since late August after escaping horrific violence in neighboring Myanmar. 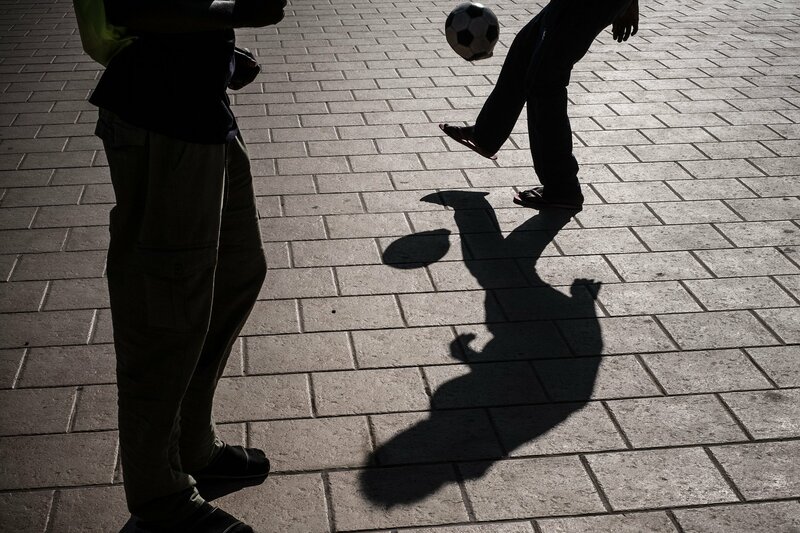 Abubacarr, 16, from Barra, Gambia plays soccer at a government administered center for unaccompanied boys that provides shelter, food, education and legal help for unaccompanied asylum seekers in Sicily, on in May 2016. 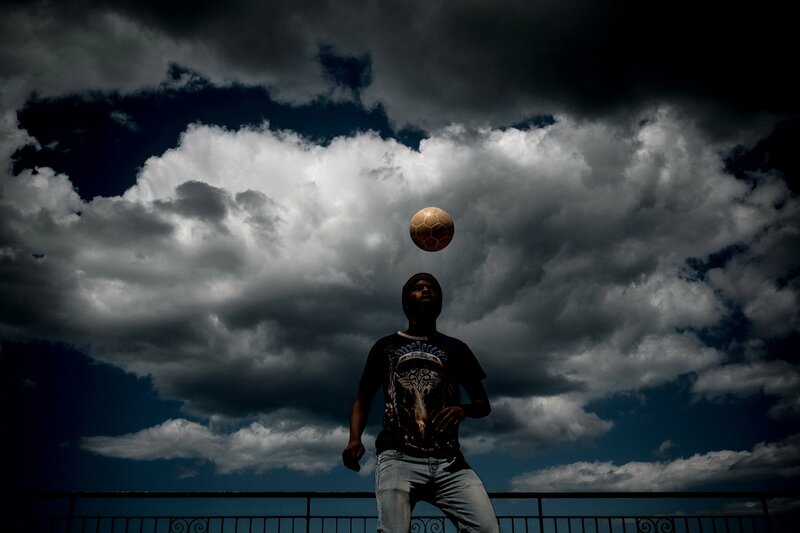 Jalil, 15, an unaccompanied minor from Bamian, Afghanistan, kicks a ball outside the S.O.S. shelter supported by UNICEF in Athens, Greece, in March 2017. 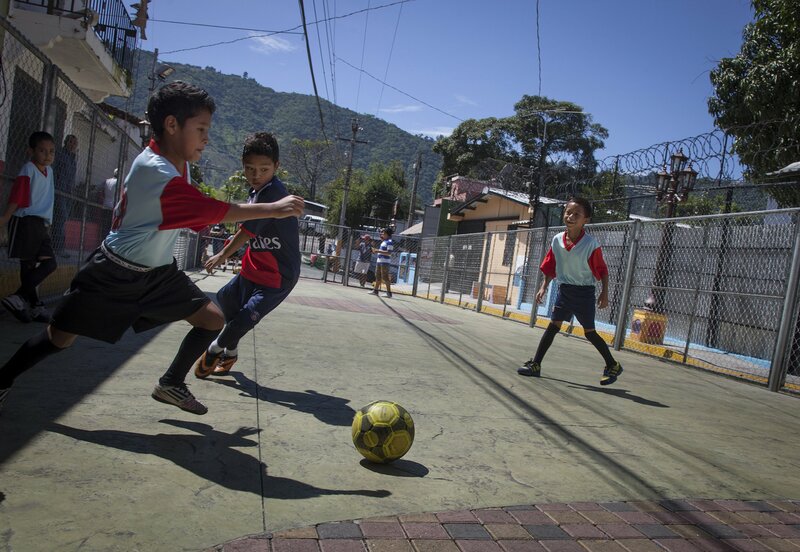 Boys play soccer on the newly resurfaced Zanconato Avenida Padre Mario in San Marcos, El Salvador in September 2014. With UNICEF support, the municipality made a space for children to play safely outdoors without the threat of violence. Boys play football at the HAPPY Kids and Adolescent NGO in Kenema, Sierra Leone, in June 2017. HAPPY provides services to children living with HIV/AIDS, orphans of people who have died of the disease, or those who are at risk of getting infected. Khaled plays soccer with his boys, Amr and Karam Raslan, at Volkspark, a park close to the refugee shelter they live at in Berlin's Prenzlauer Berg neighborhood, Germany, in May 2016. Khaleed and his family are Syrian refugees from Homs. Boys play with a soccer ball near their camp that doubles as a lodging station for unaccompanied minors in Pozzallo, Sicily, May 2016. The boys created a crew they named "Do it or die", which includes seven Gambian boys that met in Tripoli. 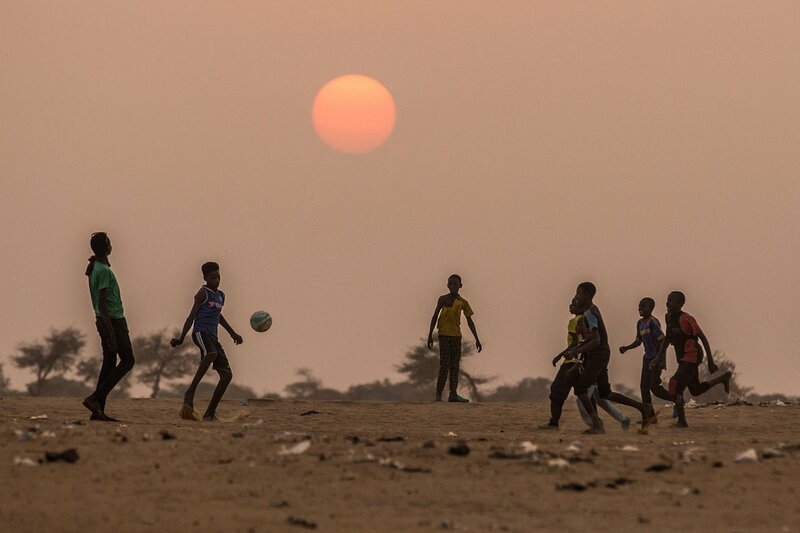 Youths play football at an informal settlement for people displaced by Boko Haram on the outskirts of Diffa, Niger, in January 2017. Niger continues to face multiple humanitarian crises, with is projected to grow in the coming years. 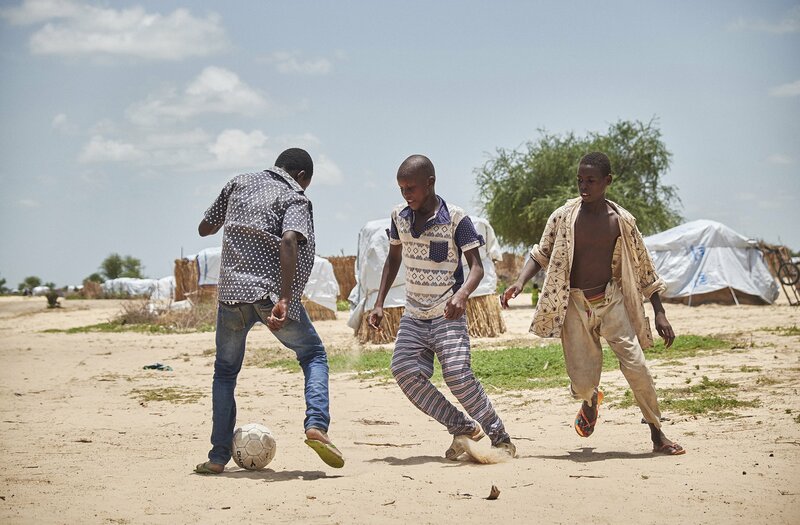 Nigerian refugees displaced by Boko Haram militants play football in Daresalam refugee camp, Lake Region, Chad, in April 2017. 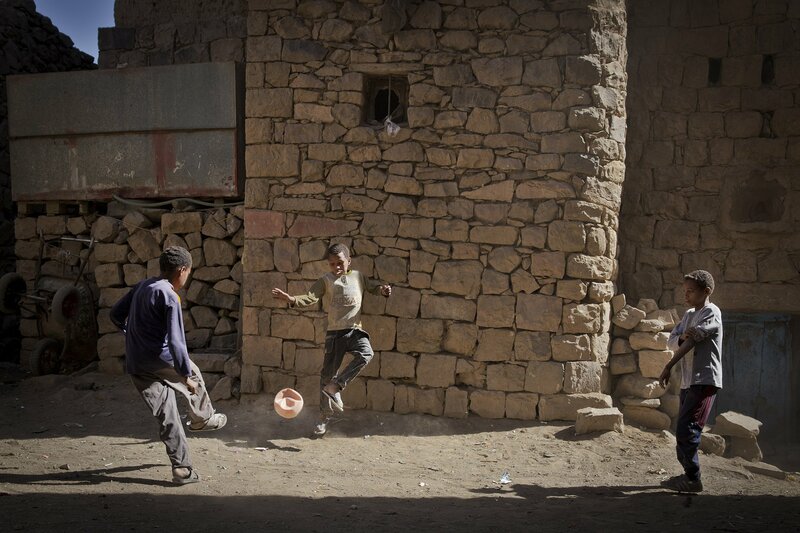 Children play football in the Muhamasheen area of Mathbah, in Sana'a, Yemen, in November 2015. Children stand alongside a football made out of rags and strings at the Pagirinya refugee settlement in northern Uganda, in March 2017. 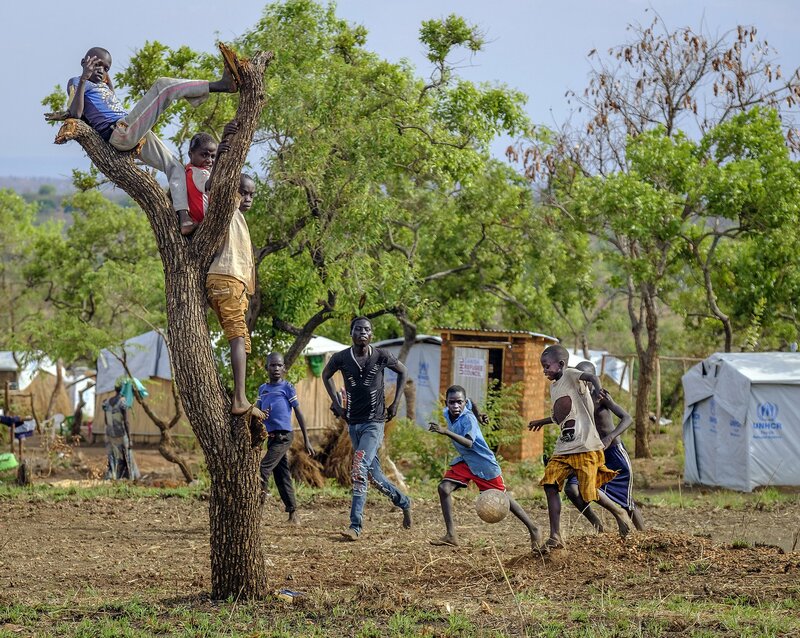 Since violence erupted in South Sudan in 2013, more than 1.8 million people have crossed into neighboring countries. 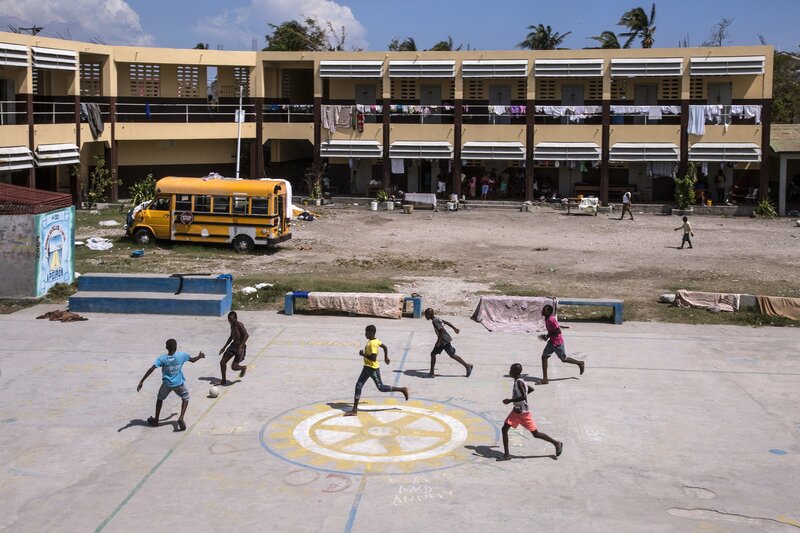 Boys play soccer in the yard of the school in, Haiti in October 2016. The space being used as a shelter for several hundred people who have lost their homes to Hurricane Matthew. Saja, 13, plays with her soccer ball in Syria, March 2017. “I love playing football. When I play football, I don’t feel like I’ve lost anything at all,” she says. Recently arrived refugee children from South Sudan play soccer in Bidi bidi Refugee Settlement in Yumbe district of Uganda in February 2017. 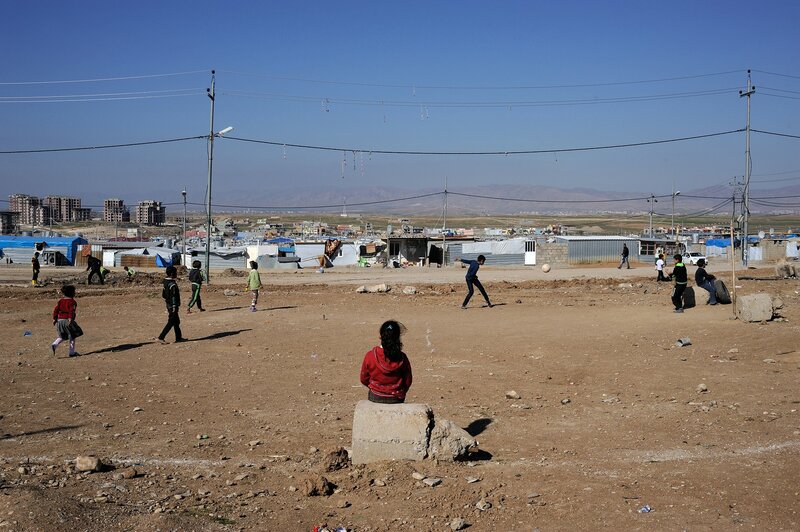 A Syrian girl watches a soccer match in Domiz Refugee Camp in Dohuk Governorate, Iraq in February 2016. 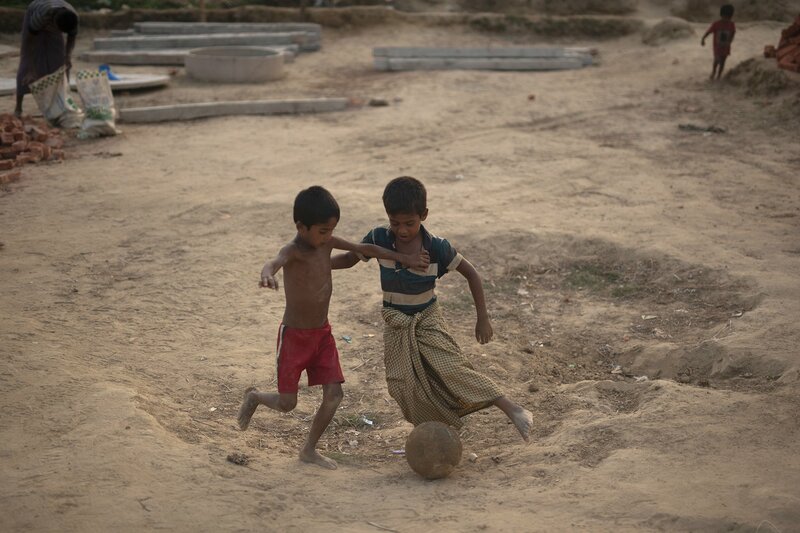 Rohingya refugee children play with a soccer ball in Jamtoly camp, Cox's Bazar District, Bangladesh, in April 2018. Moutari, 15 years old plays football with friends at a displaced people site in Garin Wazam, Niger in August 2016. Moutari is originally from Malam Fatouri, Nigeria. 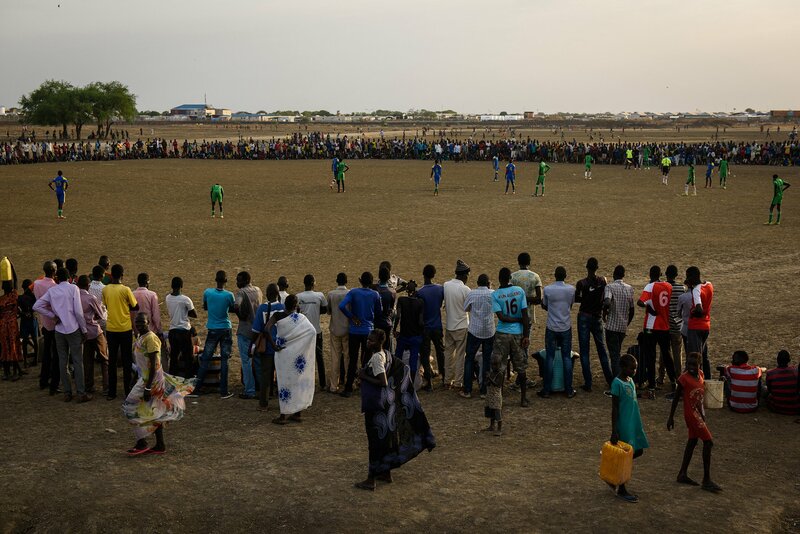 Displaced South Sudanese watch a soccer match held in the Protection of Civilians (PoC) site in Bentiu, South Sudan, in April 2017. As of May 2017, the UN PoC site in Bentiu, Unity State, is home to more than 120,000 internally displaced South Sudanese.